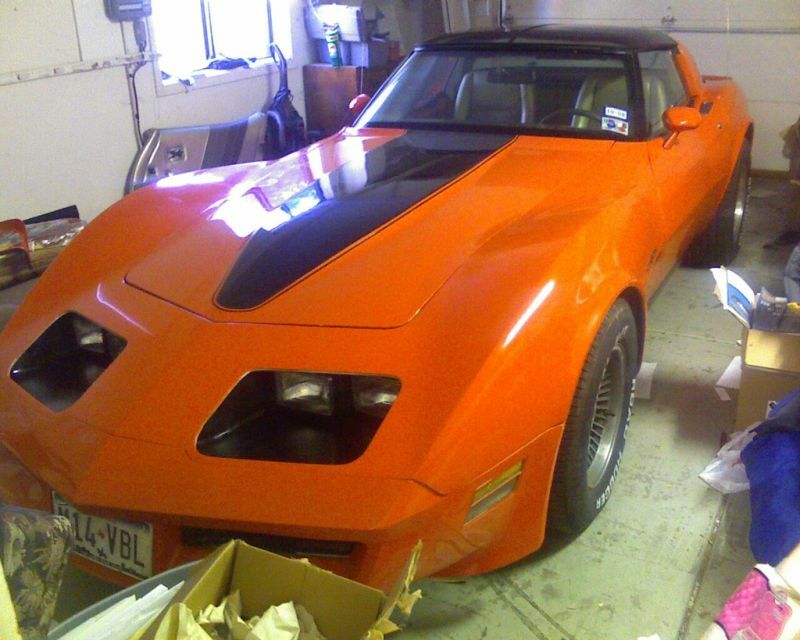 A Corvette C3 enthusiast from Texas posted this documentary on one of the Corvette forums. With his permission, I have posted it here. This truly is an account of perseverance and determination by someone in his effort to transform a car into his dream. OK, so I finally have enough time to post my Corvette story. I would love to hear comments as no one in my personal life seems to appreciate the car! I just turned 30 and got a new job with a significant pay raise, so I thought it would be a good idea to buy myself something for a change. I needed a new car anyways as I was still driving my Grandmother's 88 BMW, so I figured why not kill 2 birds with 1 stone and buy a C3..... huge mistake making this my only means of transportation! Didn't know what the **** I was doing, just looked around Craigslist locally and found the cheapest C3 that was running. I wanted one that had bad paint because I knew I wanted to customize it anyways. I got it pretty cheap due to the issues above and the fact that this was not a rust free well taken care of car. I didn't care really, I wasn't looking for a show car, rather something I could slap some paint on, repair a few things and drive it for a while. I guess I made the mistake of oversimplifying. Also I thought it might have even been a good investment....figured I would put a few thousand into it and at least get my money back if I decided to sell it down the road (wait, don't laugh yet). Also, I was moving from Texas to Arizona, so I had to drive this thing about 1000 miles. I had the mechanical stuff above fixed in Houston, no rebuild or anything, just fixed what needed to be done to keep things from leaking. Somehow this seemed like a good idea. I made it about 10 miles before the car died (1st time it had left me stranded). I called AAA, had the battery jumped, made it about 100 yards, then died again. So I had it towed back to the shop where they replaced the alternator and I was again on my way the next day. I had a bad feeling about the car already. -headlights were lazy...the right one you had to manually lift up. -a/c only blew on the floor. I had the electrical issues worked out at least so I could connect my ipod for the move. I was actually looking forward to all the little projects at this point. A few weeks later I packed it full of clothes for the drive to Phoenix and my girlfriend and I were off. Somewhere about 3 hours east of Albuquerque the engine locked up while driving...this was not in a town mind you, it was in the middle of nowhere at about 3 in the afternoon. I had a few tears and then some stress. Fortunately I had some cell phone reception and called AAA and told them I was about 10 miles past some little town on whatever highway we were on. They said they would send someone right out. An hour went by with nothing. I called them again and they said the tow truck couldn't find us, so I reassured them we were just west of this little town and I recommended they just drive until they saw us...it could have been more than 10 miles I figured. Another hour went buy...nothing. Like one car per 15 minutes would drive by...pretty empty road. Someone finally stopped and informed us we were on the wrong highway so we called the tow truck and about 1 hour later they finally reached us...just at dusk. We opted to have them tow us on the flat bed all the way to Albuquerque which took about 3 hours. The tow truck guy was about 80, very few teeth, significant arthritic knuckles and his truck looked about in as good of shape as he did. Also, he liked to drive in the middle of the road when no other cars were coming. He veered onto the shoulder a few times as well. My girlfriend's main concern was that he wasn't going to eat us. I had called up and found a Corvette shop in Albuquerque (I hate spelling that word by the way)....Scotty's Southwest Corvettes. They were super cool, gave me their cell phone number and told me to have it towed there and they would meet me after hours....which they did. We got a ride to the airport and flew to Phoenix where I had another car I could use while mine was being repaired. I opted to replace the engine with a GM crate 350/290HP rather than putt around with rebuilding the old one. Scotty had it up and running in a few weeks which was perfect timing for me to get settled and have it drivable before my new job started. I flew back to pick it up, then drove it the 500 miles to Phoenix. Unfortunately, I was sick during this trip and by that night I hadn't eaten in two days and was having anxiety attacks....bottom line I ended up in the emergency room. I called my new boss at home at midnight and told him I would not be able to start my new job the next day and they understood. Another day went by and I again called in sick to my new job at which point they fired me! This is a whole 'nother story involving an a**hole company which I ended up pursuing legal action against. 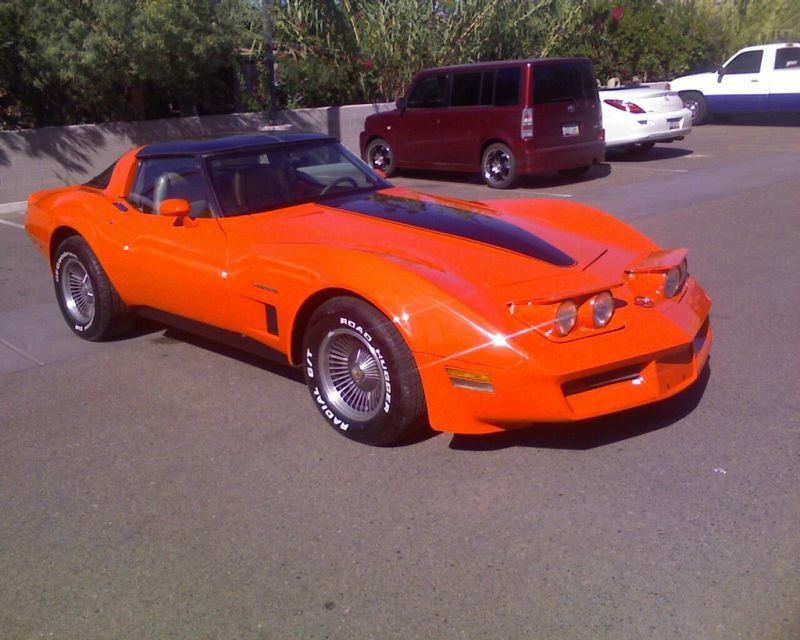 So here I am, just moved cross country for a new job that I no longer have, spent about $5k in car repairs thus far for a still ugly Vette which has now played a significant role in costing me my job. Oh, and I can't have my old job back in Texas, nor can I even work in my old city for 18 months due to a non-compete clause with my former employer. At this point I'm living on my aunt's couch. So I spent a week in bed and then found another job and got on with my life. The Corvette was running better, but still sputtering along and eventually started dying at stop lights unless I put it in neutral and revved the engine slightly. Nothing else was fixed yet either. I was now working with The Vette Shop in Tempe, AZ which is another awesome shop and Ken is great (this is my 4th Corvette shop in 4 months in 3 different states if you're keeping track). He sorted out my throttle bodies (I did not know what a throttle body was at that point) and had me finally driving a well running car another $1500 later. -took the dash off and got the vacuum hoses sorted out for the a/c controls. -took the doors apart as by this point the driver's side latch was not working at all and I was climbing in through the passenger's side. In the process shorted out the power door locks, dash lights, and tail lights. -started looking into body work/painting. - -a tire goes flat one day, but there is no leak so just aired it back up..? I was left stranded again (third time) by a bad alternator (this was the replacement one if you remember) so I had the car towed and sorted out once again. BTW I never got around to putting the dashboard back in, so I've been driving for 2 months with no dash, no radio, and for a while no speedometer. Back to pulling the headlights up manually. Also, at some point the power steering core went out and I had to replace that....a couple hundred bucks if I recall. A cop pulls me over for no tail lights. 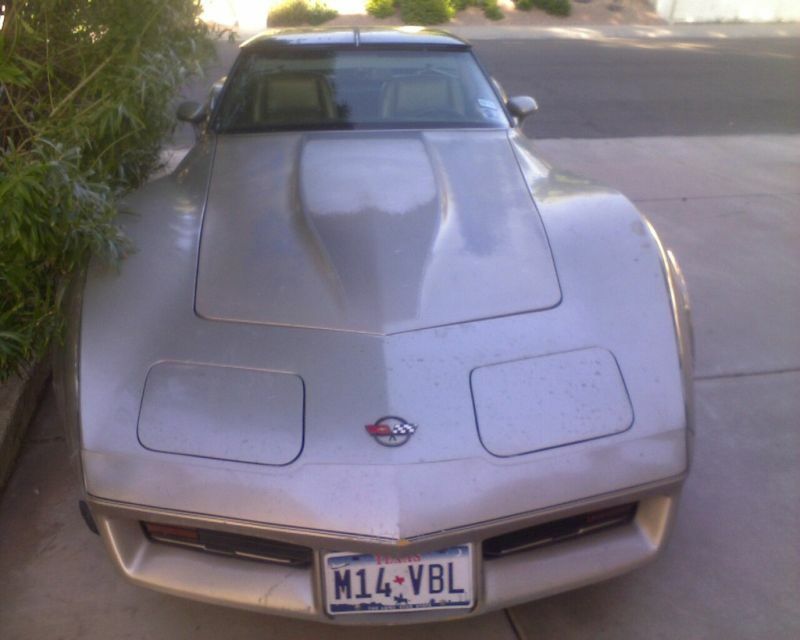 I'm still out of state, ugly Vette, no insurance card on me, no dashboard....did have the speedometer in place though. The cop gave me a ticket for no tail lights and no insurance and told me that I could potentially have other violations with the no dash thing; but I assured him everything else was working fine, just cosmetic. The cop was filling out the ticket and actually asked me: "what year car?" followed by "what make?" 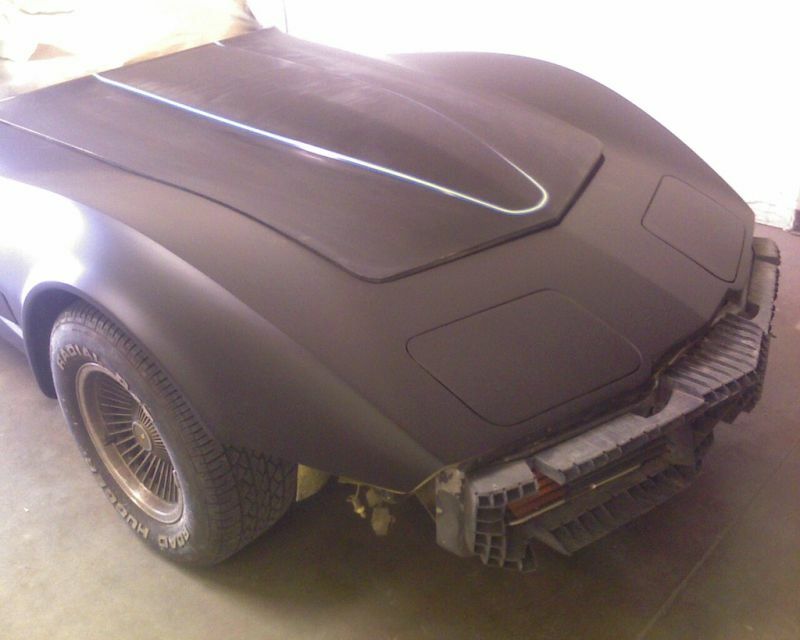 to which I replied...its a Corvette. He said "no, that is the model, what make?" I paused, humored him in a slow voice and said Chev-ro-let makes Cor-vettes. I think he was just messing with me to see my reaction since he was white, male, middle aged, and pulled over cars for a living. BTW, try dating a new girl when your car looks like this....not sure how I managed, but landed a great girlfriend during this time period. I finally got to the point where I could get the body work done. To my surprise, it cost more then a couple thousand dollars. All previous paint I had done on cars was around $1000 for dents/fender benders, etc and I figured it couldn't be much more than that. Estimates ranged from $6k to $15k depending on the shop and whether I replaced the front clip or just repaired it. Holy Sh*t!!!! I was not prepared for that one. That cost more than the entire amount of money I had put into the car up to this point. So much for my investment idea. 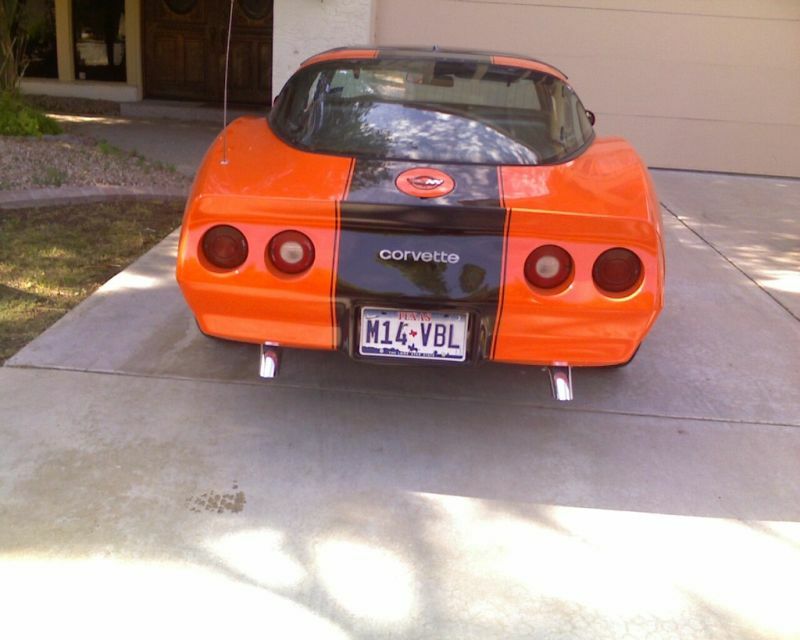 At this point, I had since joined the Corvette forum and read much about C3s as well as browsed ebay and had a better understanding of what these cars are worth (aren't worth rather) and at least I knew the direction to go from here. I wished I had put a bigger/better engine in, but at the time was sort of desperate to just get it running. Finally decided to go with Maaco for body repair....couldn't justify the higher price for a car that was never going to be perfect....just wanted something as a daily driver that I would find appealing and others would be jealous of....not a show car and not a performance car. 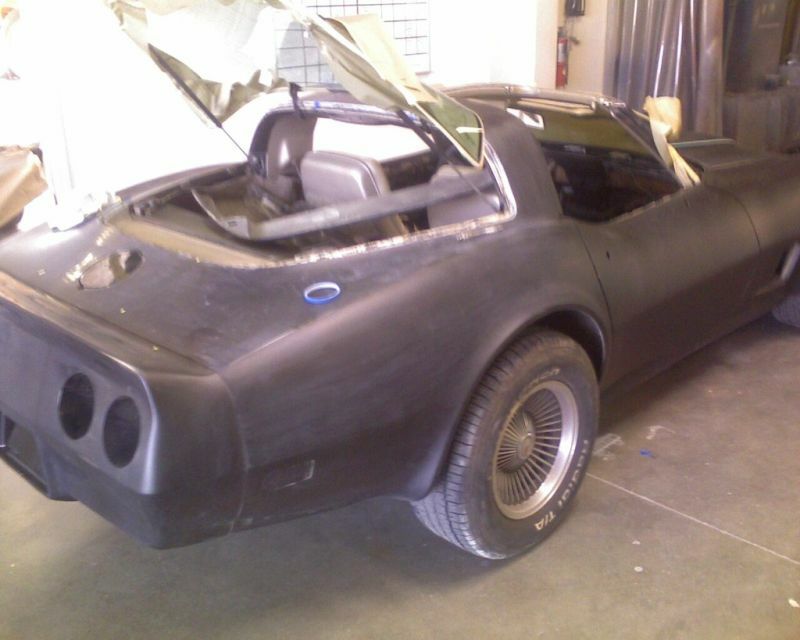 One of the guys at Maaco had done a lot of Corvette work previously and showed me several project cars he had worked on. I went with the top of the line they offered with primer, base coat, clear coat and it includes a 5 year warranty which was more than anyone else offered. 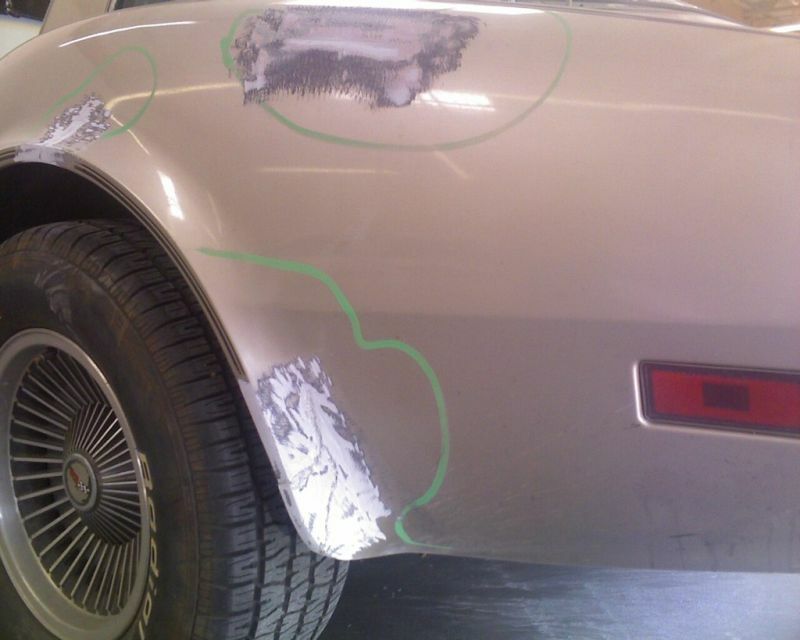 It took about 2 months, they stripped the car down, were able to repair the fiberglass, seal the fiberglass, prime it, and then paint it. I had looked at paint for a long time and decided on '69 Monaco orange with a black racing stripe. 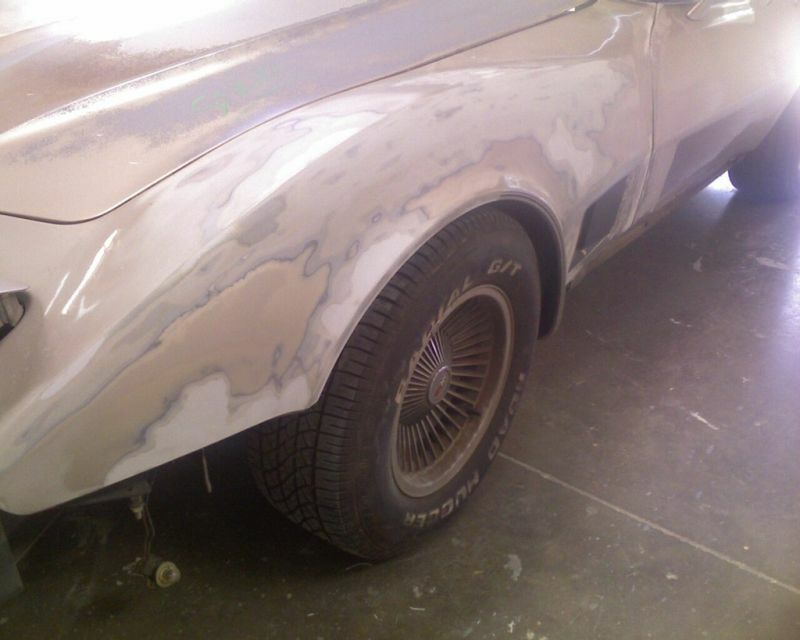 I feel Maaco did a great job and I got everything done for ~$6500 including color sanding and polishing. So I drive home from the shop and as soon as I get in the driveway, I notice a coolant leak. I took it in to the Firestone within walking distance of my house and they indicated an intake manifold gasket leak was present. I didn't know what the *** that was, but it cost about $600 to fix. I have since learned all about intake manifold gaskets and how they are not covered by warranty when you purchase a crate engine. Finally I got the car back, drove it for the first time other than home from the shop. I was feeling really good about myself and that it had all been worth it now that it looked like the Vette I had always dreamed of. I got to a stop light, the guy next to me motioned for me to roll down my window....I'm thinking oh yeah, my first admirer. He proceeded to tell me my hub cap had just flown off a few blocks back....bummer. These are collector edition rims mind you so they are probably worth a bit as a set. I turned around to go and look for it and then the car started to sputter and then eventually died as I pulled into a church parking lot. Crap! Oh wait, I hadn't filled up the gas tank since August...I'm probably out of gas since my gauge doesn't work! I got the dash back in, was going to focus on the interior which is actually in good shape, someone must have replaced it along the line. I just decided I was going to go with black interior instead of the CE that was already in place. But, now I started to get a bit tight on money, so figured I should wait since it was in good shape. 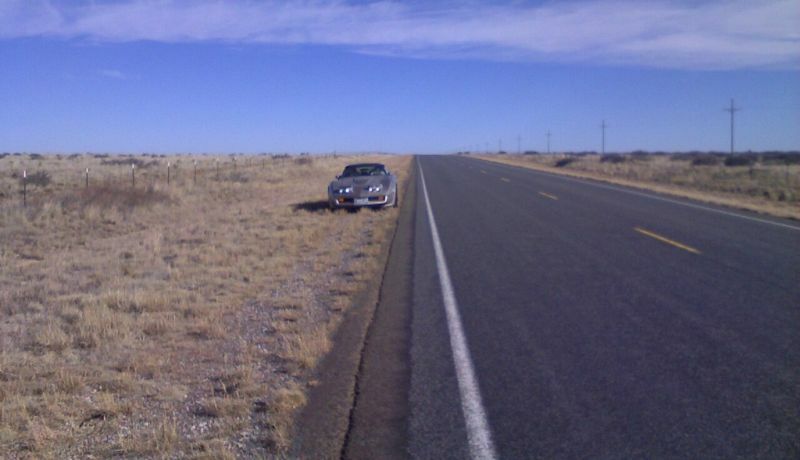 Also, realized I had no stereo in place since I took the dash out in April....makes for a boring commute.....oh, and I left my ipod in the rental car in Albuquerque so I had no music anyways (forgot that part of the story). I replaced the hatchback hinges with ones ordered from a forum member ($350) as well as struts. Actually I was only able to get one hinge on....the other bolt that holds it in place has the screw stuck in it still and will not budge....so I have one new hinge and one old one. But at least the gap in the window is gone! All weather stripping is done. It was starting to get cold, so I turned on the heater....get home and there was another coolant leak. This time it had to do with the heater core hose or something....fixed that and also found some more power steering hose leaks so fashioned new ones as well. I replaced power antennae with a new one that I had bought almost one year prior. I replaced pop up head lights with fixed/recessed ones which I like the look of better (not to mention not having to deal with the vacuum system any more) and sold the old ones for a profit. However, in the process I lost the a/c charge as it blew up 10 feet in the air when I took the front headlights out as I had to partially remove whatever the thing is called that is in front of the radiator. -dash is in, getting a stereo very soon. I have been waiting until the door locks are working properly so I can actually lock the doors. Fortunately I live and work in a nice area, so I haven't actually locked the doors to the car since I have had it...for a long time the latch didn't work and now the lock sticks so bad that it is too hard to open with the key from the outside.....need to take the door apart again and actually clean the lock out this time. -front spoiler still needs to be mounted...I have a new one and the screws, but need to make a new metal bracket to support it and weld it in place. -There is a rattle noise coming from the engine or transmission for the past 6 months or so....doesn't seem to affect anything, but just doesn't sound good....haven't had the time to get it looked at. So, that is about it for now. 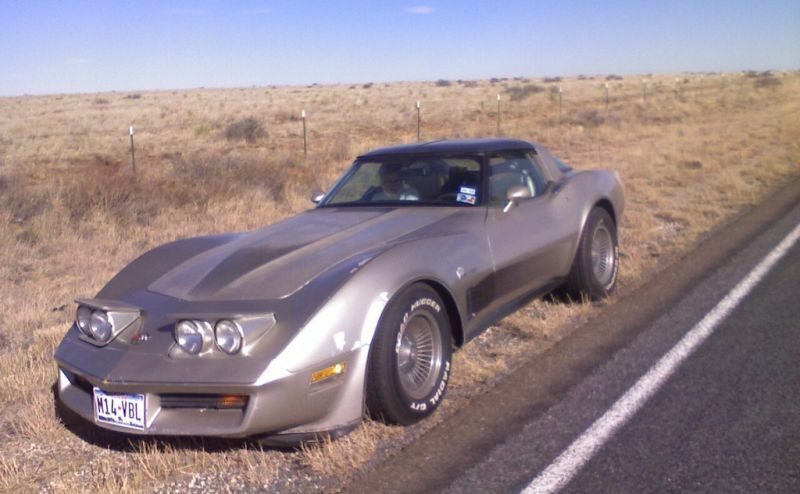 I do enjoy my Vette, but if I had to do it over, would have paid $20k for one that someone else had already done the work on and put in performance parts and done a frame off or something. I have at least that much into it and it will never be top quality. I do get many comments on it...mostly from rednecks though. I do see lots of people doing double takes when they drive by or try not to stare when I'm at a stop light next to them. I'm joining a local corvette club in Feb so will finally find some people who can give me tips and appreciate the love/hate C3 relationship.